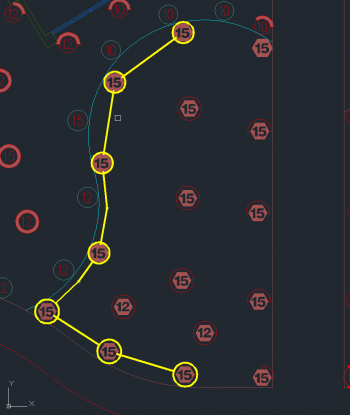 Irrigation design is a uniquely demanding and precise science. A software that can accommodate this rigorous engineering process isn’t just helpful – it’s imperative. 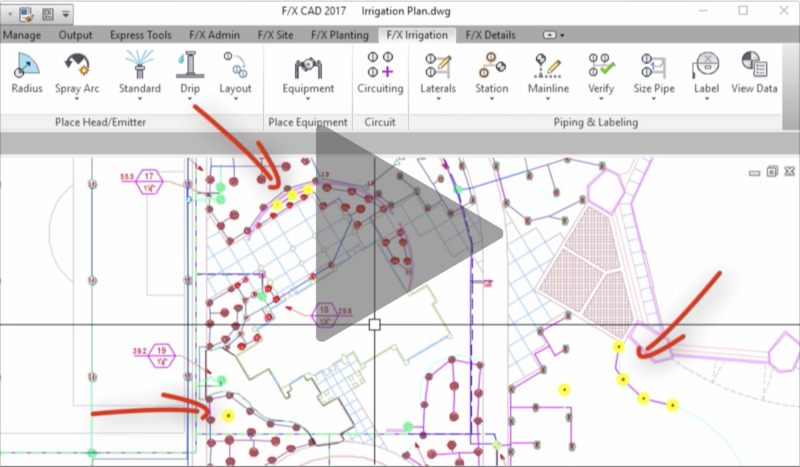 Simplify your process for even the most complex designs using Irrigation F/X – a comprehensive irrigation design plugin for AutoCAD. 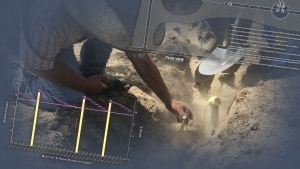 Irrigation F/X can handle the most exacting standards and complex designs. 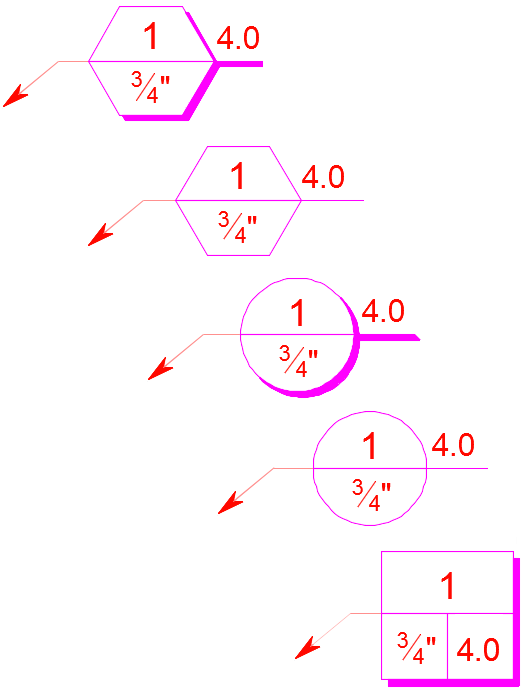 Create a schematic layout to plan your system before placing a single head. 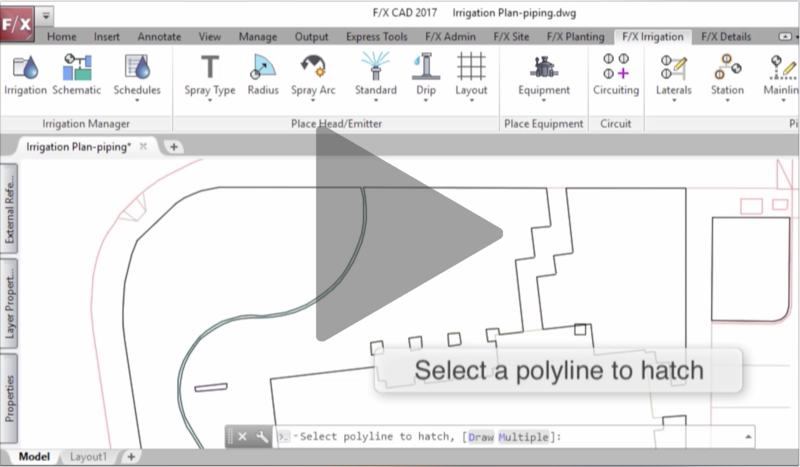 Specify equipment and add pressure and flow data, all from a dialog box in AutoCAD. Lay out and size your lateral and mainline pipe faster than ever. Check for errors and ensure uniform coverage by barely lifting a finger. Rest easy that everything will be accurate. Generate instant schedules and reports, and send them to spreadsheets. Multiple pumps, sources, or elevation changes? No problem. 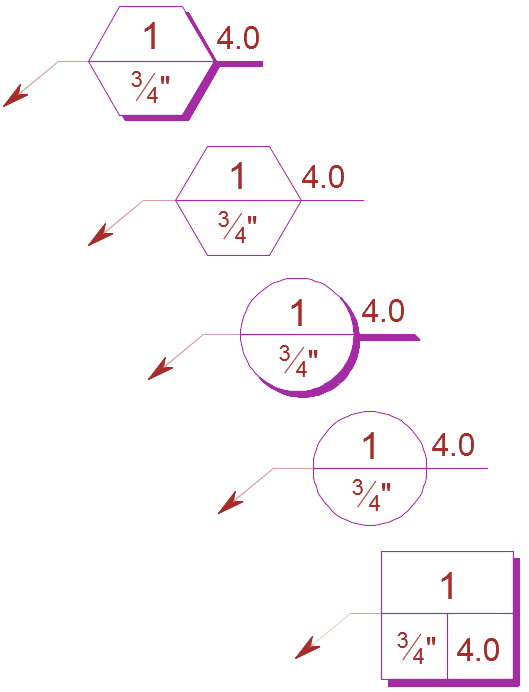 Calculations are automatic and based on the Hazen-Williams Formula. You provide the layout – we’ll handle the rest. We’re constantly evolving our irrigation system design software based on feedback from our clients. It’s how we continue to give you the tools you need to work faster and more efficiently. 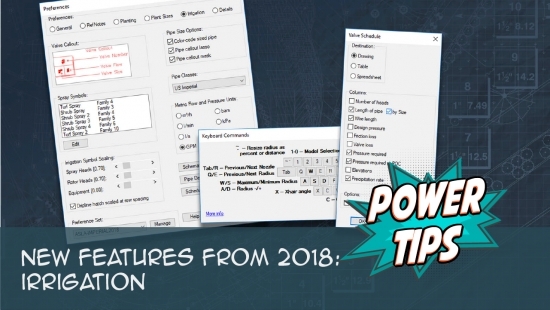 Each week, we produce a short Power Tip video (about 2 minutes in length, on average) showcasing our latest user–requested features. 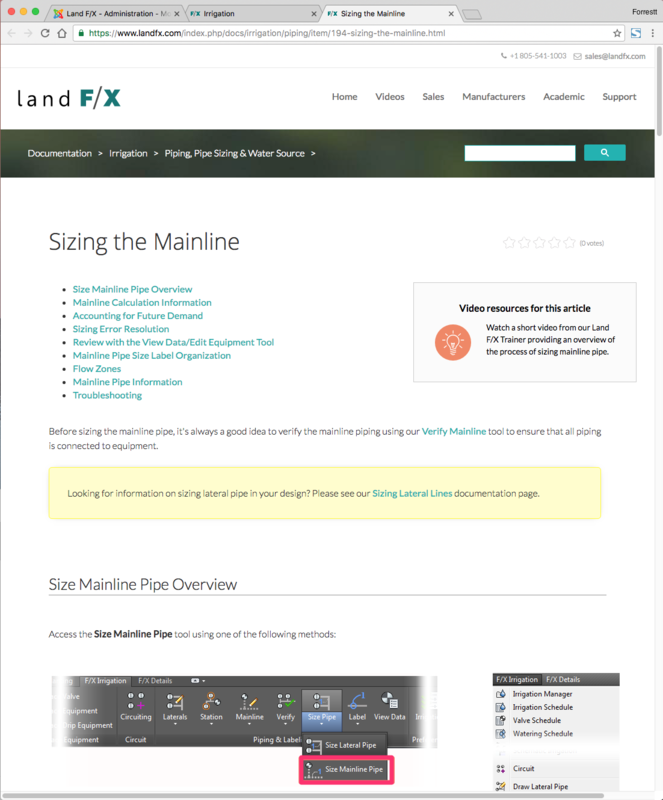 Draw mainline and lateral pipe, and size it automatically with a click. It’s just one of many ways we help you save time and ensure complete accuracy. 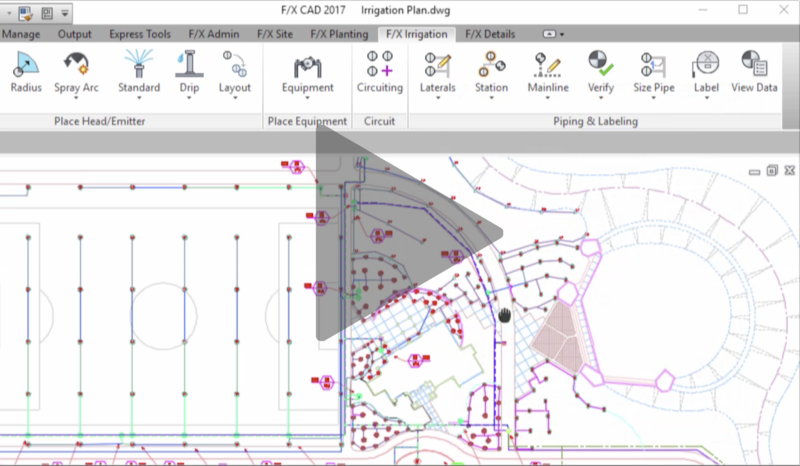 If you’re currently doing irrigation design by hand – or even in AutoCAD but without our irrigation plugin – you’re essentially freehand drawing your design with no assurance of accuracy. Then there’s the sheer tedium: checking the friction loss charts and performing calculations manually for each length of pipe. Applied to hundreds of heads, that means hundreds of headaches. 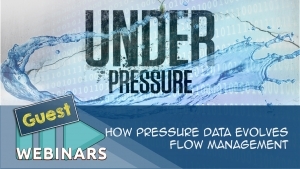 Even if you’re a whiz at the Hazen-Williams formula, you’re literally wasting hundreds or even thousands of hours applying all the data to your design, adding up all the flows and calculating friction losses. Guesstimation is inevitable, leading to overdesigned or underdesigned systems. 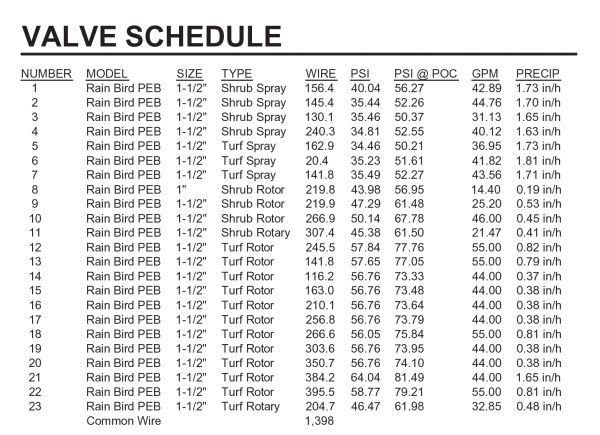 Our piping system has all the formulas, calculations, and measurements built in. Draw your pipe from head to head. Calculate the flow totals automatically. Then click a button to perform Hazen-Williams. Your system is sized accurately, just like that. With all the time you’ve saved, you’re free to do all the manual calculations you want – you just won’t have to. Select a pipe class for your part of the world. 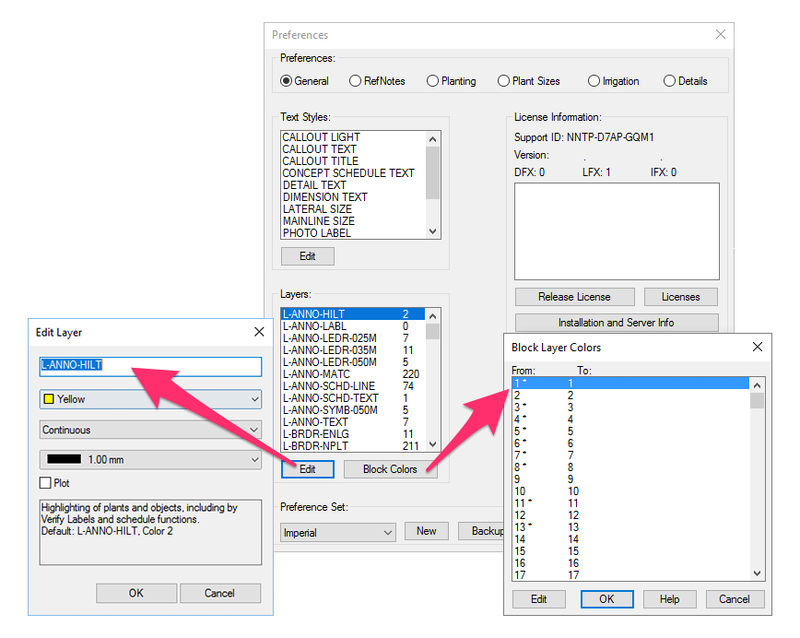 Specify your lateral and mainline pipe categories from a dialog box in AutoCAD. You have complete control over stats like maximum flow velocity, pressure variation factor, and minimum pipe size. All data for your laterals and mainline will be automatically built into the pipe as your draw it. Click a button, and draw a line to draw your pipe. Our piping tools are designed to “grab onto” heads, valves, and other irrigation equipment you’ve placed in your drawing. Instant sizing is the coup de grâce of our piping system. Just click a button and size your mainline or laterals. 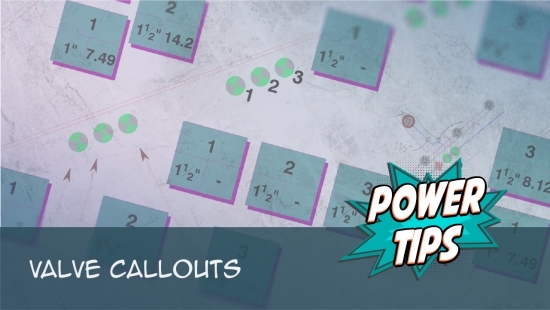 Pipe size callouts are added automatically. Automatic pipe sizing is incredible, but automatic error checking is indispensable. Our Verify Laterals and Verify Mainline tools ensure that you’ve drawn, sized, and called out your pipes correctly. Your design standards are unique. They don’t just set you apart from the competition – they make your drawings look great. We give you the tools to enforce and improve your standards across all your plans. We understand the importance of creating designs that look like nobody else’s. 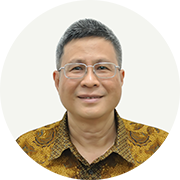 That’s why we’ve made customization a central capability of our software. 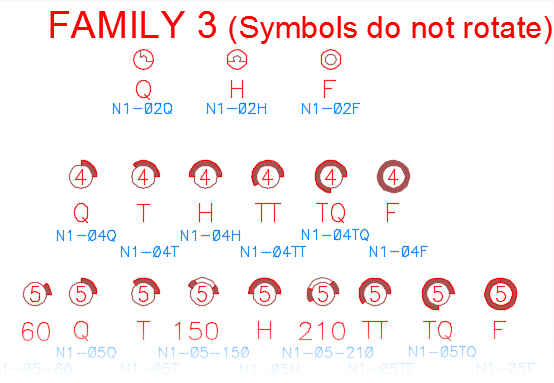 Your installation includes an almost staggering number of irrigation symbols we’ve created for your use. Don’t see a symbol style you like? You’re free to use yours. 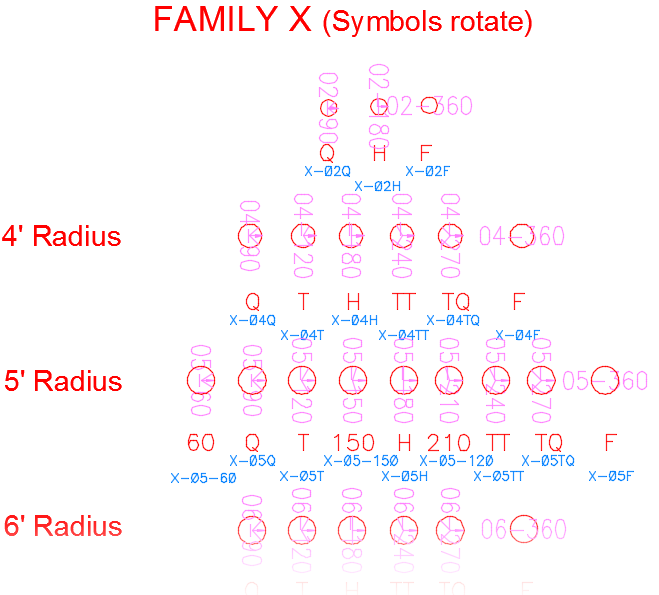 Add your symbols to our library of symbol families, and place them as blocks from an AutoCAD dialog box. Call out your valves and pipes in a way that meets your standards. 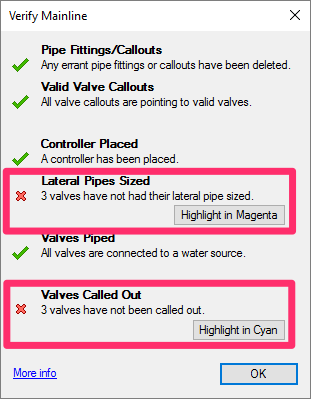 Our valve callouts and pipe labels are fully customizable – just open the source drawing, make your changes, and save. 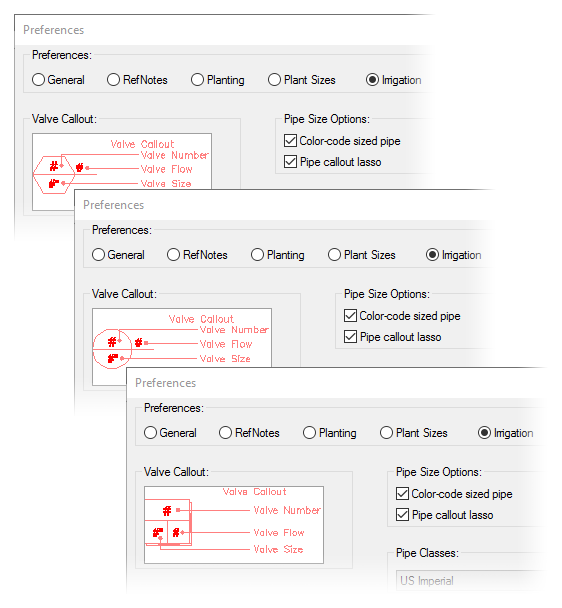 Or choose from a variety of default valve callout styles. Inventory your project equipment to your exact preferences, including as much – or as little – information as you want. 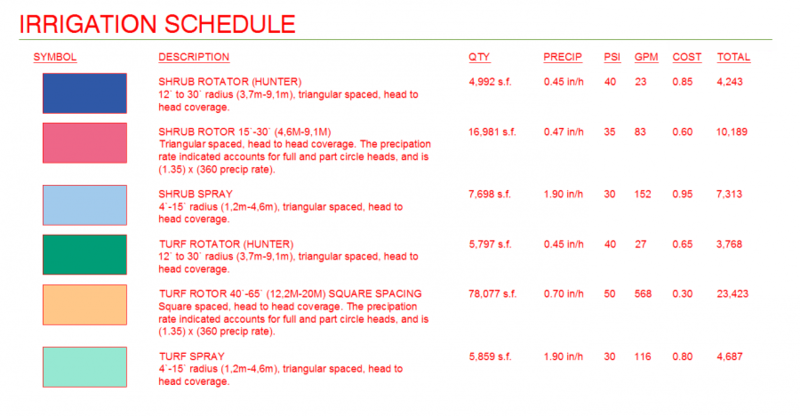 Place a schedule directly in your drawings or in table format – or send it to a spreadsheet to edit to your liking. Our default system of Text Styles makes it easy to apply your standards to text in your drawings –like irrigation schedule and callout text. 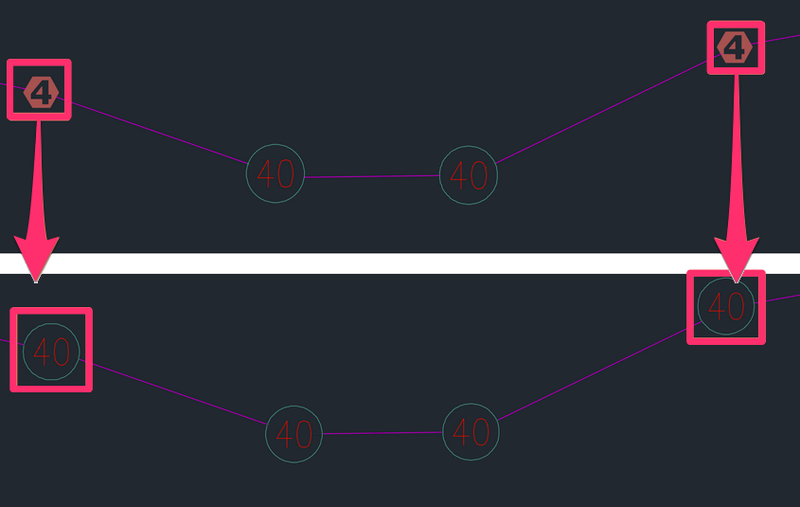 Customize fonts, point sizes, widths, and more. 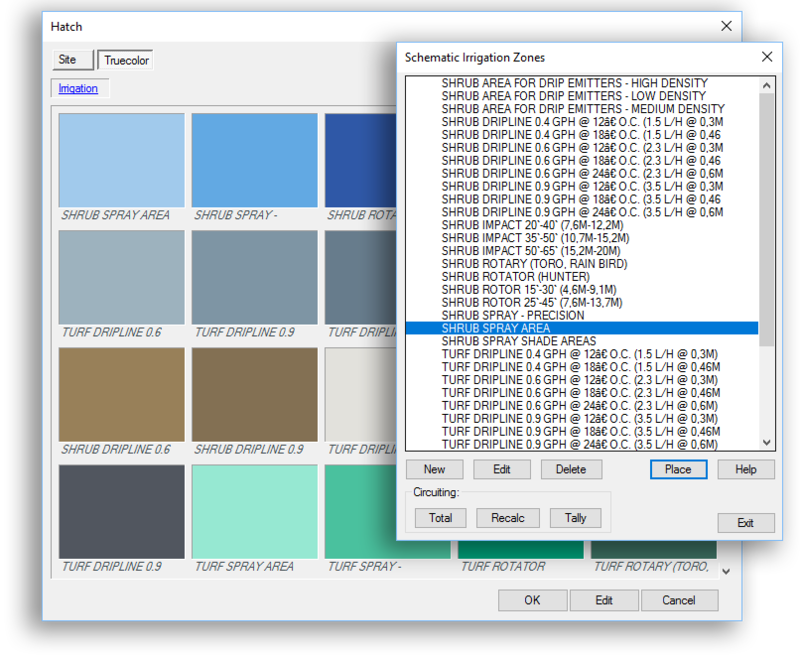 We give you complete control over the names, colors, linetypes, and lineweights of your AutoCAD layers. 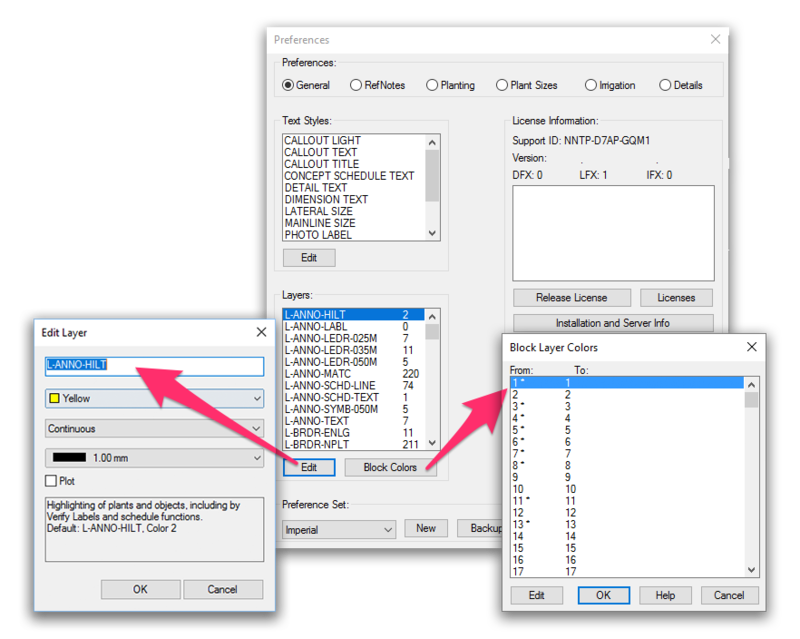 You can also customize all 255 colors used by AutoCAD as index colors for plotting. Edit each color to your standards, and you’ll draw and plot exactly the way you want. 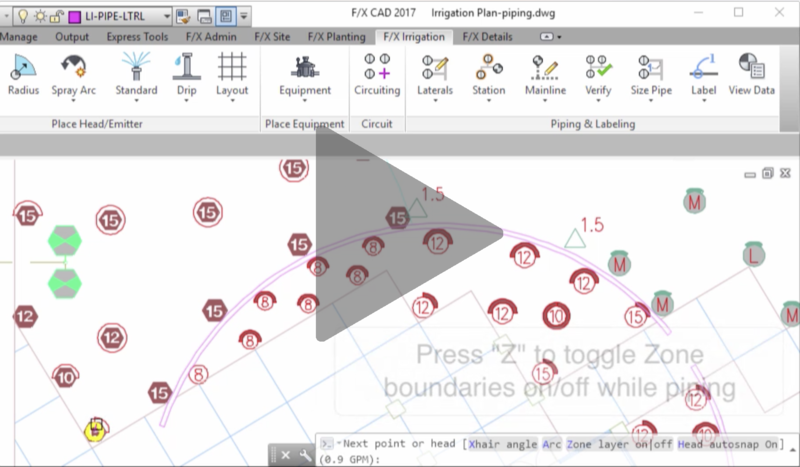 I have used F/X CAD and Irrigation F/X since November 2013. They are very great products. It takes a learning curve, but once you familiar with the software, it is very easy to work with. We've been using Land F/X for over 8 years now and have NEVER been disappointed. The technical support and professional team of trained staff have helped keep us happy and productive. Instantly produce and customize any schedules or reports. Leave the calculations to us. Our one-click scheduling and reporting tools give you instant access to all the data your client or contractor might need to see. List all equipment you’ve used or specified in your project in an easy-to-read reference. 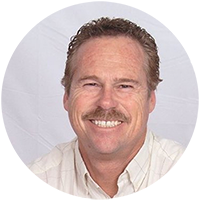 Include, or don’t include, data such as quantity, pressure and flow rates, schematic costs, and more. List spray heads by croup or by nozzle – it’s all up to you. Schedules are automatically separated by equipment type for quick reading. Provide comprehensive information about each valve in your system, including model, size, type, friction loss, valve loss, pressure and flow statistics, and head and pipe count within each valve station. 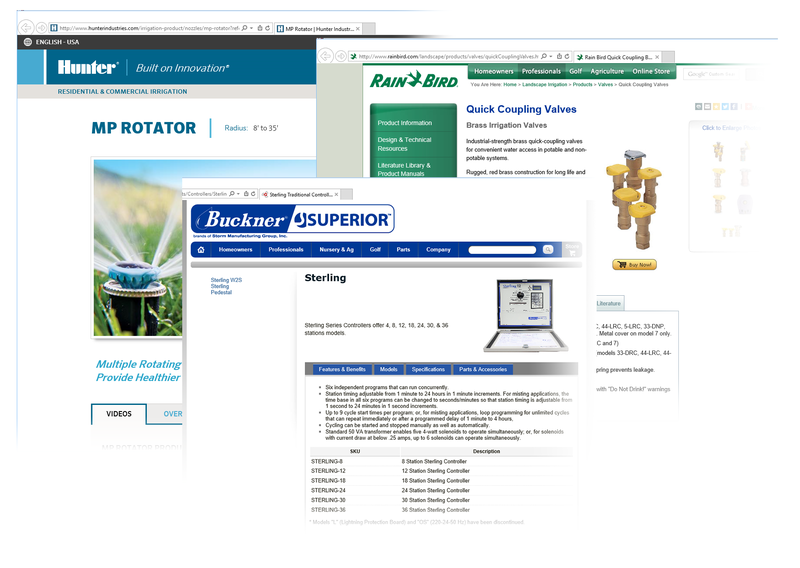 Instantly prescribe your site design’s daily watering needs by individual zone. Select which days of the week will require watering. Daily and weekly watering minutes will be calculated and listed automatically. 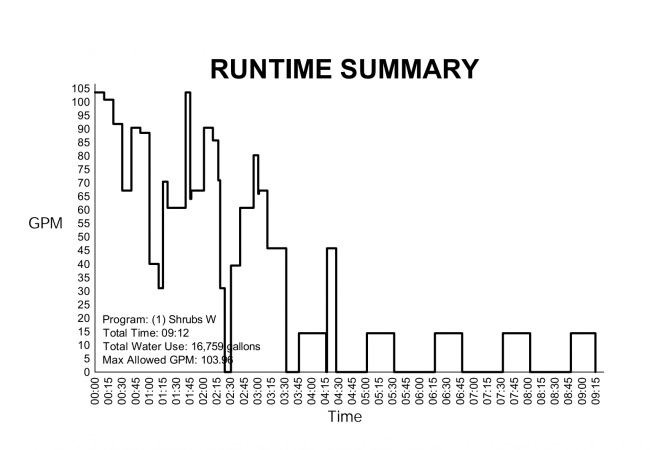 Our Runtime Schedule tools duplicates the basic analysis a “smart” irrigation controller would perform on your system as laid out. It’s a quick way to determine the most efficient runtime for your system according to the mainline’s capability. 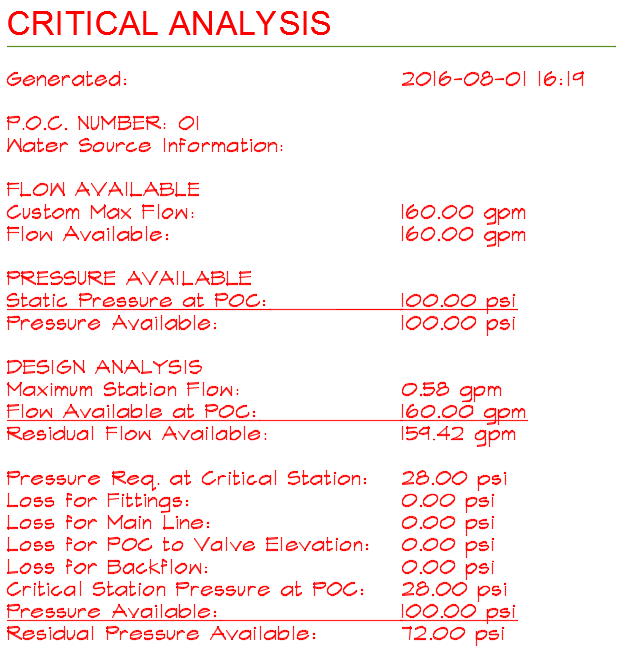 This valuable reporting tool provides pressure and flow statistics for your entire system. It serves two important purposes: helping you troubleshoot and correct pressure and flow issues in your system, and communicating your design requirements to your clients or contractors. Choose equipment from a extensive database of manufacturers, including complete performance data and pre-assigned symbols. Spray heads, drip emitters, valves, backflow devices, controller and controller accessories, booster pumps, thrust blocks – we’ve got them all and more. If you have a favorite equipment model, chances are it’s in our equipment database. 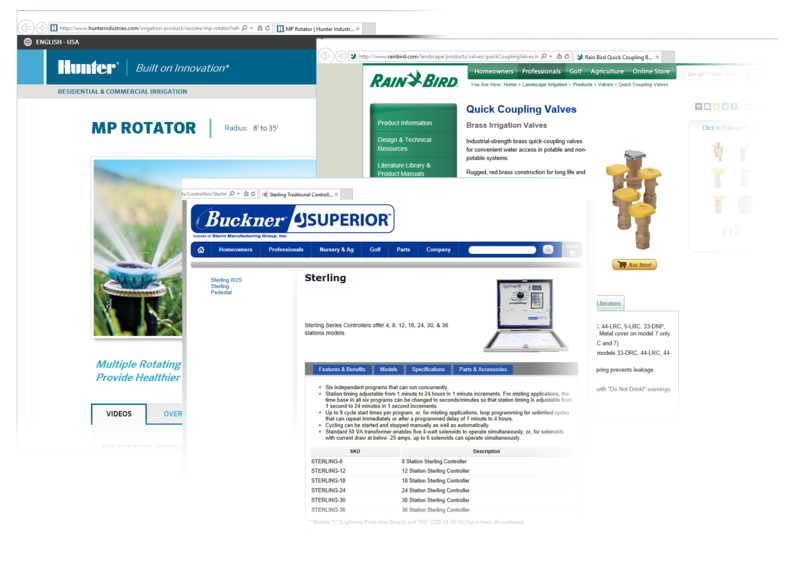 We have agreements with 35 (and counting) manufacturers of irrigation components to include their equipment data in our software. 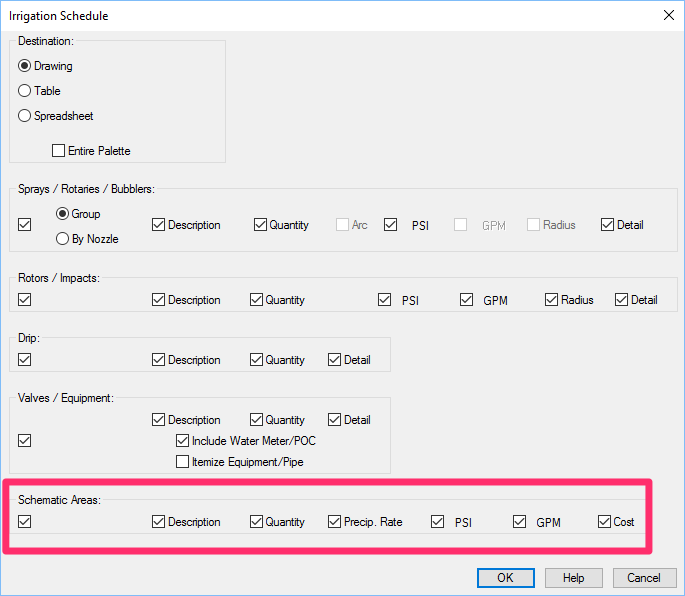 That means you can spec a head, valve, drip emitter, backflow device, etc., for use in your project directly from a dialog box in AutoCAD. Select the exact make, model, and series you’re looking for. 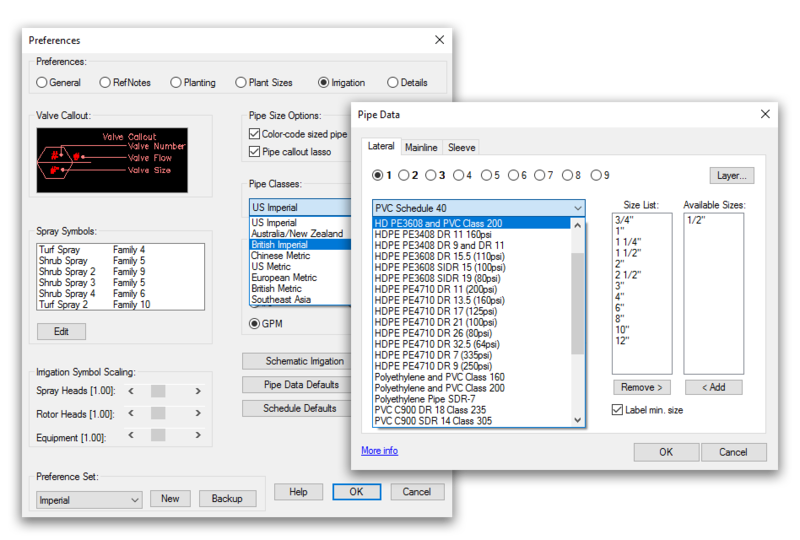 You can even add custom data such as flow ratings and nozzle types. Connect directly to each participating manufacturer’s catalog. No more flipping through paper catalogs, digging for the exact head you need – not to mention sifting through all the myriad options available for each piece of equipment. Just a few clicks, and you’re ready to start laying your spray or drip irrigation system. 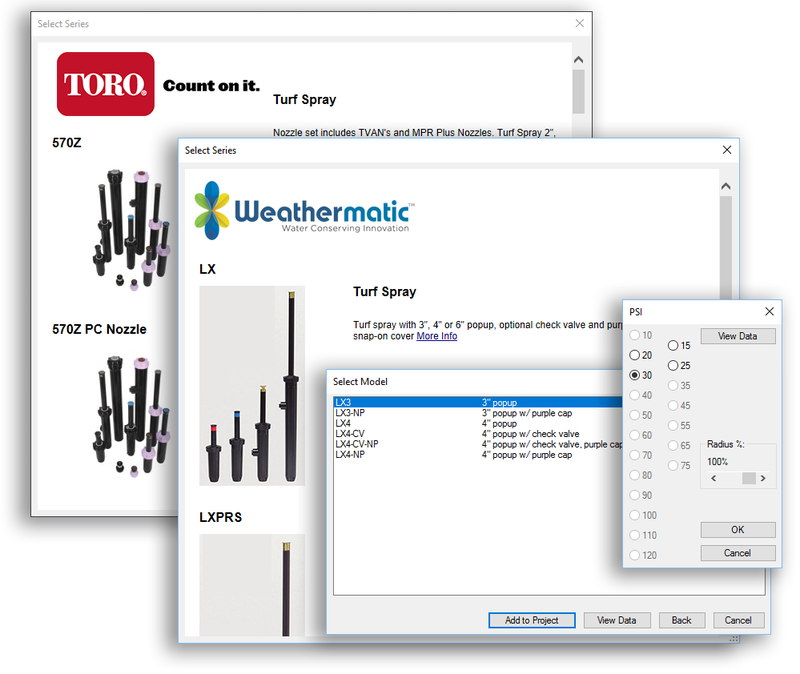 Design software that makes equipment specification this easy isn’t just valuable – it’s necessary. 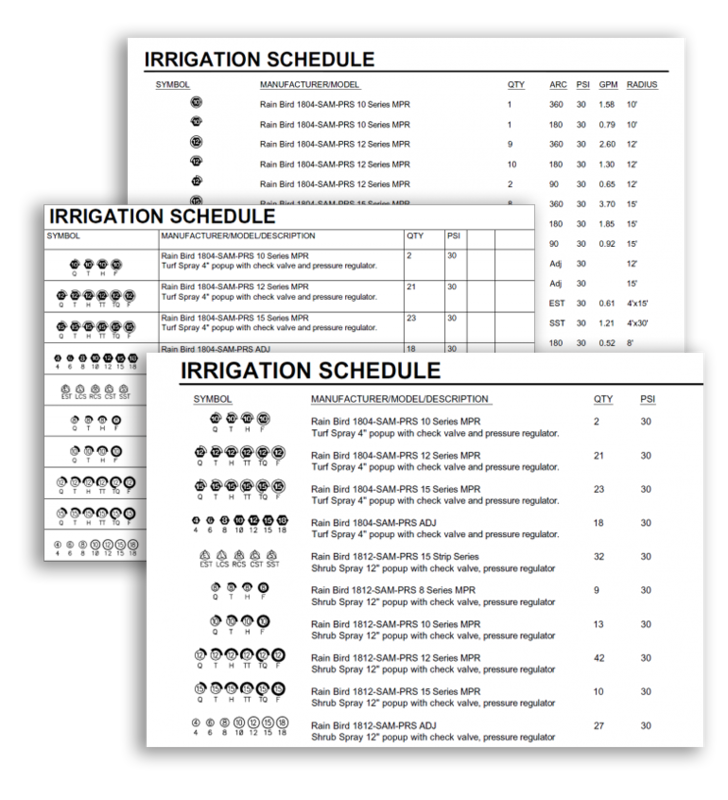 Our Schematic Irrigation tools help you visualize your plan before you lay a pipe or place a single piece of equipment. 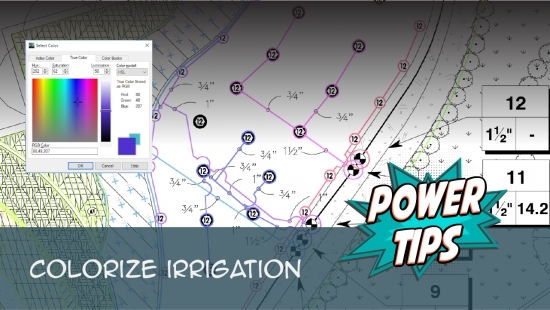 With our Schematic Irrigation tool, you can quickly sketch out your system design by creating “zones” for each type of emitter you plan to use. Choose from a variety of emitter categories to start building your schematic zone. 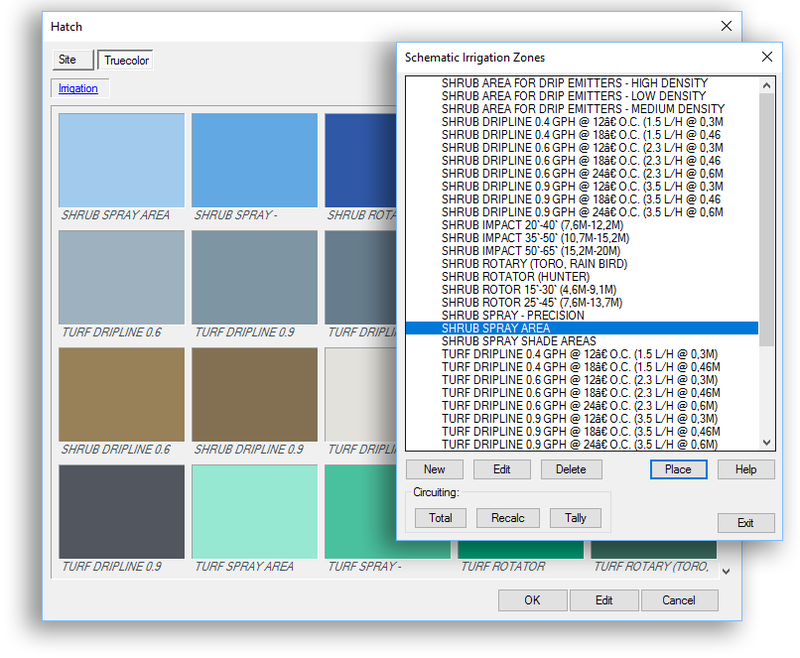 We’ve front-loaded each of our schematic categories with a distinct hatch color to represent that equipment in your schematic design. 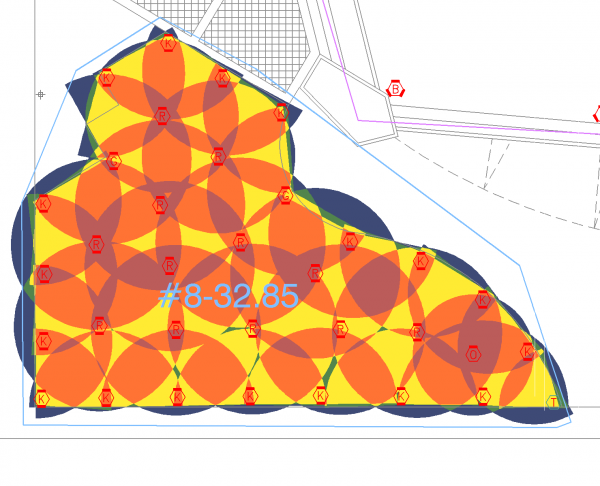 Draw the areas where you plan to have coverage from the emitter type you selected. The software will instantly calculate and place an estimated flow rate for each zone, based on the square footage as well as the default pressure and precip rates we’ve assigned to that emitter type. Create as many zones for as many emitter types as you think you’ll use. Need to tweak the precip and pressure rates for a given schematic zone? No problem. Just click a button and edit it. 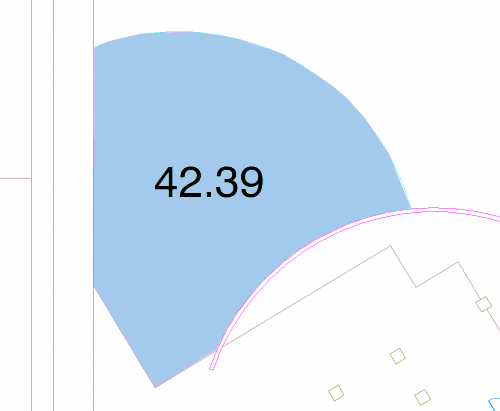 You can even add an estimated cost per square foot or meter for each zone. Don’t see the equipment you need? Just create a new category. You can place an inventory of your schematic zones just as you would for specific equipment. 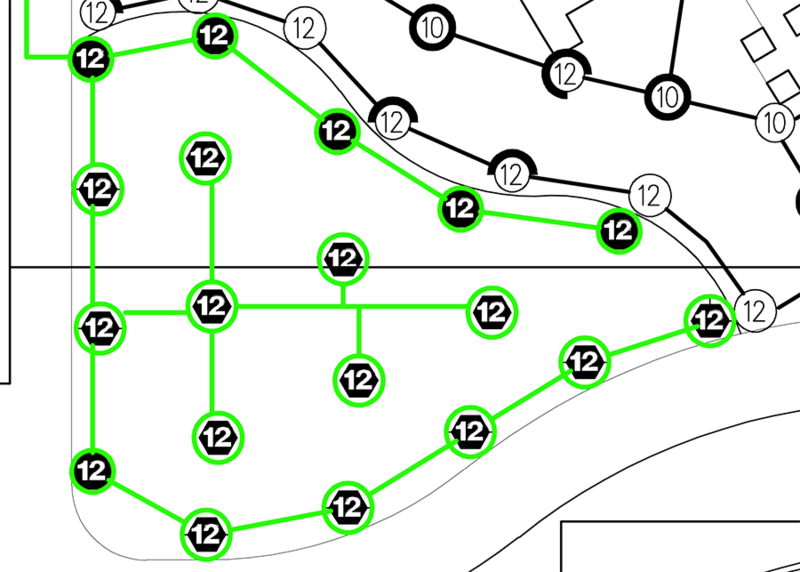 Just run an Irrigation Schedule and select the option for Schematic Areas. Include as much or little information as you want. Your Schematic Schedule will list and describe all your schematic zones in detail, with color-coded hatch symbols for each schematic category you’ve used. It’s a quick and easy way to show your design intent and make any necessary changes before you start laying out your system. Errors are inevitable; undetected errors are not. Our error-checking tools will find every piping error, giving you the assurance that your plan is completely accurate. We won’t judge you if you don’t create a perfect design on the first try. We’ll just give you the tools to ensure it’s perfect when it counts. You won’t believe you ever got by without this one. 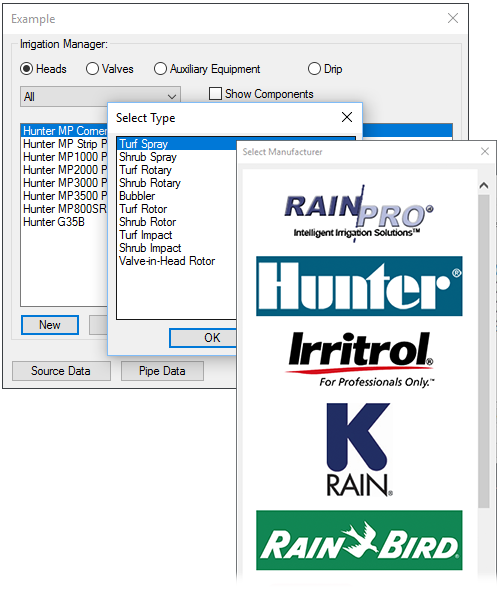 Our Verify Mainline tool scans every valve station in your design, making sure you’ve piped, sized, and called everything out correctly. Errors are marked with a color-coded highlighting system for easy location and revision. In short, it’s a must-use. 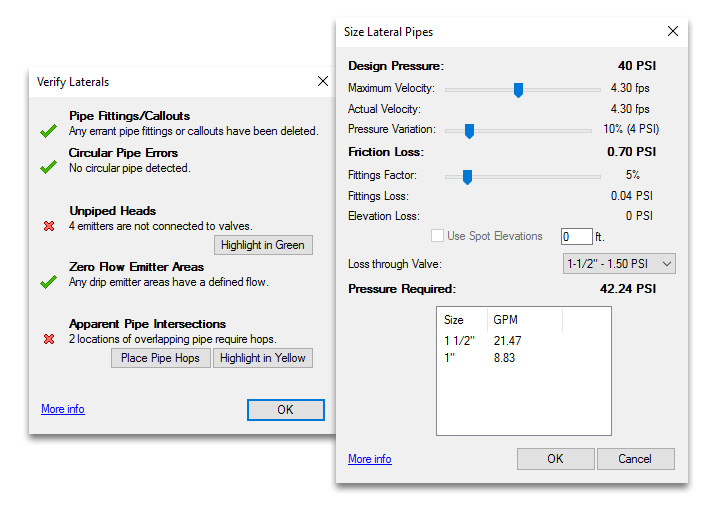 Our Verify Laterals tool looks for specific errors in your head layout, including unpiped heads, apparent pipe intersections, and circular pipe errors. You’ve already piped to all your heads, and now the client is asking for massive revisions. Do you have to delete it all and start over? Nope. Just open our Move Piped Equipment tool, then click and drop. All connections will remain intact (along with your sanity). Test the uniformity of coverage created by your head layout. With a single click, you’ll have an easy-to-read, color-coded layout of your coverage for easy editing. Can’t find one of the 60 valves in your layout? Now you can! Just open our Locate Valve tool, select the valve number, and boom! You’re zoomed in on that valve. When revisions come in, or when you need to re-pipe, you may need to delete equipment, pipe, or callouts. To retain your connections, use our Delete Station tool. 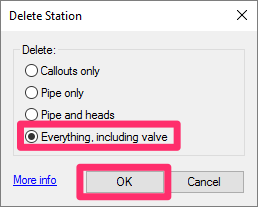 You can use Delete Station to delete all pipe or all callouts in a station, or delete the entire station, including the valve. 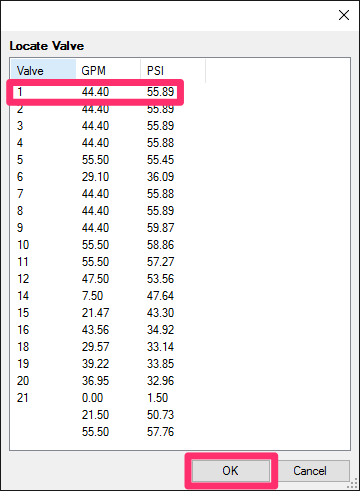 Need to verify connections or simply find a given valve in a big plan? Our Highlight Station tool instantly checks whether all your heads are connected properly to pipes and valves. 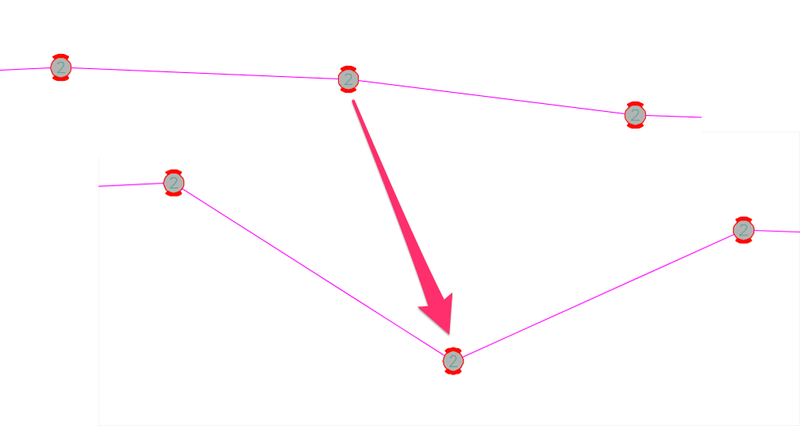 With a click, you can locate an entire station in your drawing and check whether all heads in that station are piped. 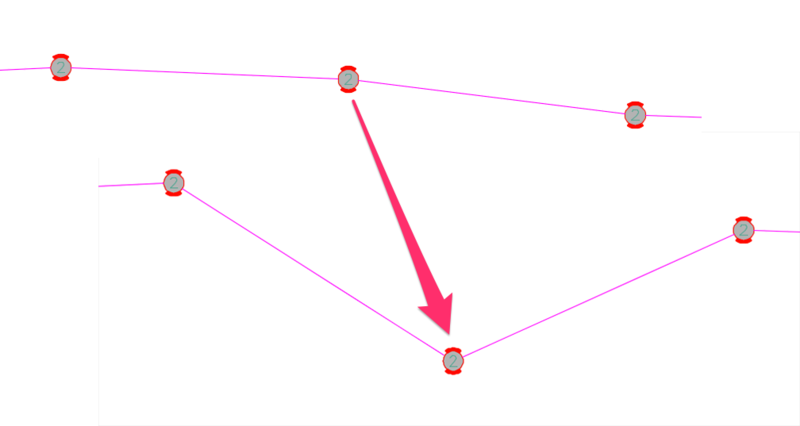 Even highlighting a piece of equipment you haven’t piped yet will highlight that same equipment wherever you’ve placed it throughout the drawing and produce a quantity of that equipment in the Command line. Highlight Station also includes a Colorize feature that renders an entire station into the color of your choice. It’s a great way to distinguish stations from each other, create an as-built controller map, or just add some color and variety to your plan. Switch out a head or valve for a different model instantly while maintaining all connections. If you’ve already called out the valve you’re switching out, the callout will be updated automatically. Match Properties is a quick, easy, and foolproof way to make last-minute (or first-minute) revisions to your plan. 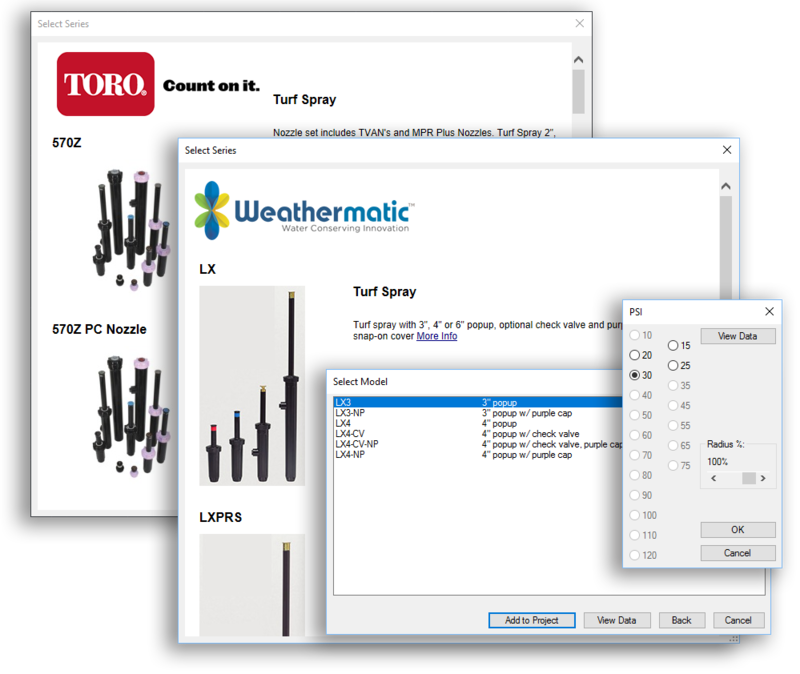 When you install our landscape and irrigation design software, you’re installing a set of additional AutoCAD functions designed just for you. It’s like your landscape architecture tool belt. Need a little help? We’ve got the learning resources you need. We strive to make CAD-based landscape design simple, intuitive, and fun. 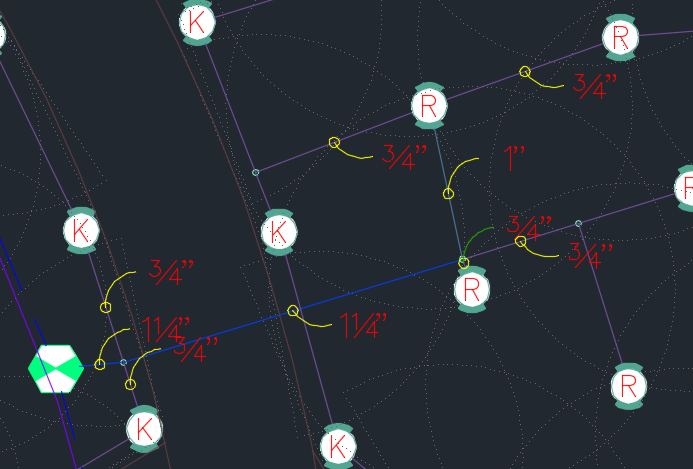 More than just calculations: AutoCAD tools. 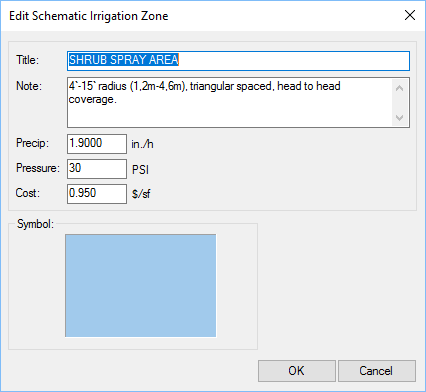 Work from within the industry standard of AutoCAD, armed with an array of tools geared specifically to the demanding requirements of irrigation design. 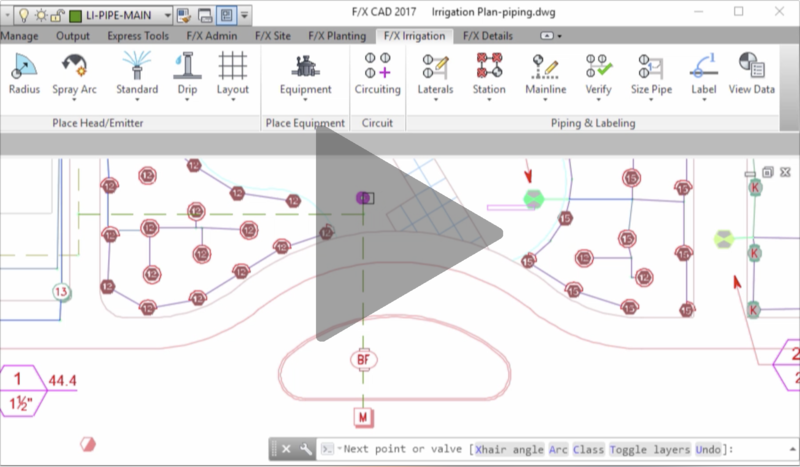 Irrigation F/X is an AutoCAD plugin. 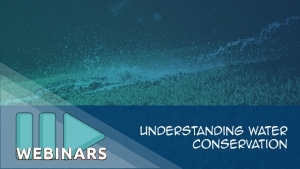 That means you won’t have to learn a whole new software platform to take advantage of our irrigation design features. 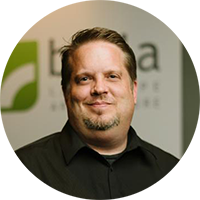 We essentially open up AutoCAD and drop in a new set of tools geared toward your profession. So although you’ll have some new tools and techniques to learn, you won’t have to start over. 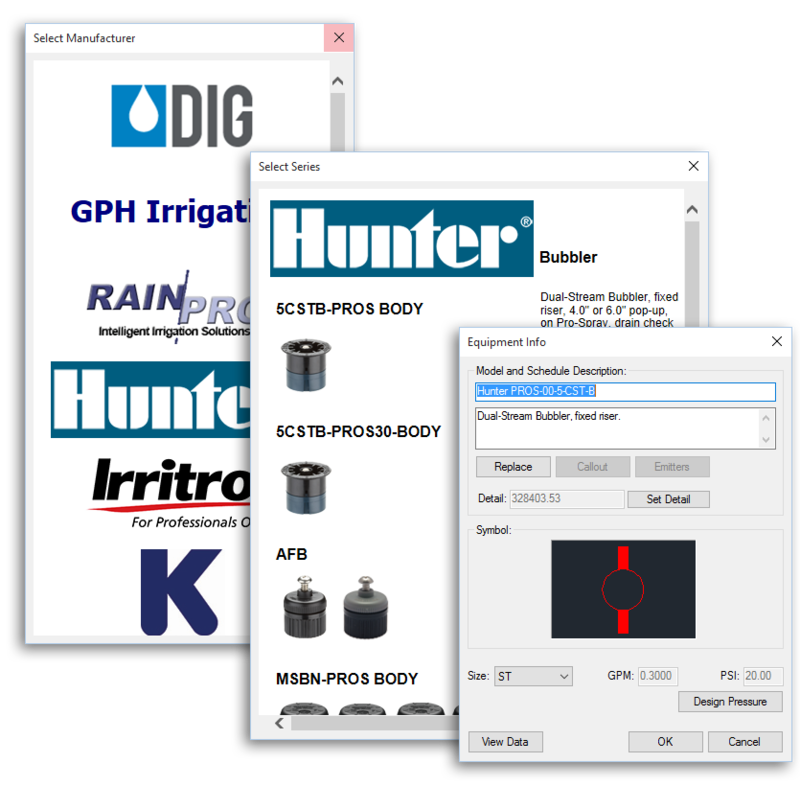 In fact, many of our tools incorporate some native AutoCAD features, essentially transforming AutoCAD into irrigation CAD software. Just think of it as the most helpful upgrade of your existing AutoCAD platform that you can possibly imagine. Laying pipe is as simple as drawing a polyline – except the pipe automatically grabs onto equipment. Placing equipment is just placing a block – except it’s automatically embedded with manufacturer information and performance data. 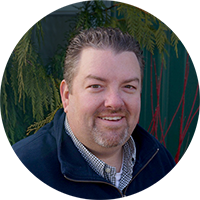 Throw in instant scheduling, callouts, error checking, and pipe sizing – not to mention our details, planting, site amenity, and hardscape design capabilities – and you’ve got all the tools you can possibly need to design a site. And it’s all built right into your familiar CAD environment. We don’t make AutoCAD any more complicated; we just enhance it with automatic calculations, error checking, “smart” blocks, and other tools that make your job easier, ensure accuracy, and save you inestimable amounts of time. 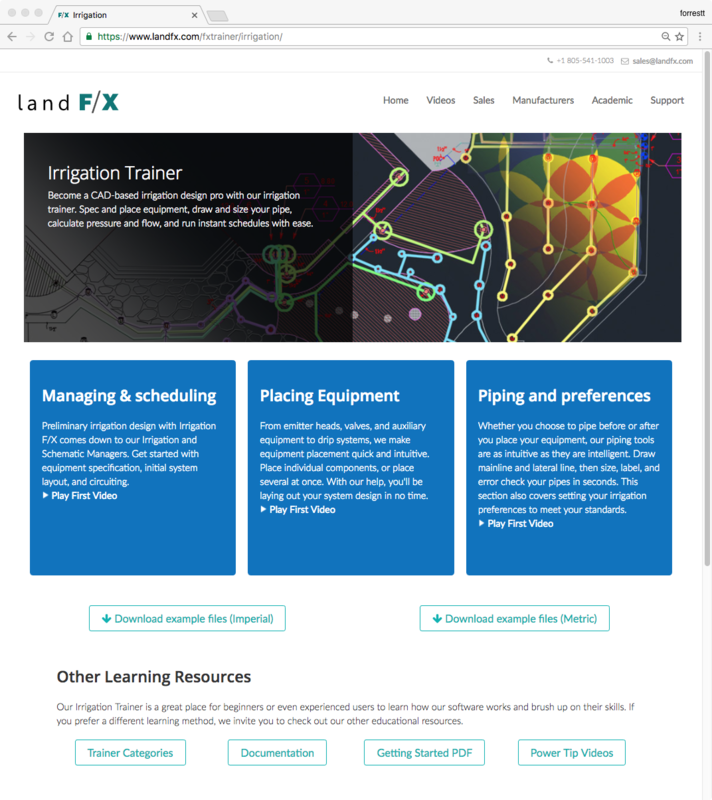 Sign up now for a free trial to find out exactly why Irrigation F/X is right for you.